Ethan Hawke and Sally Hawkins in "Maudie." 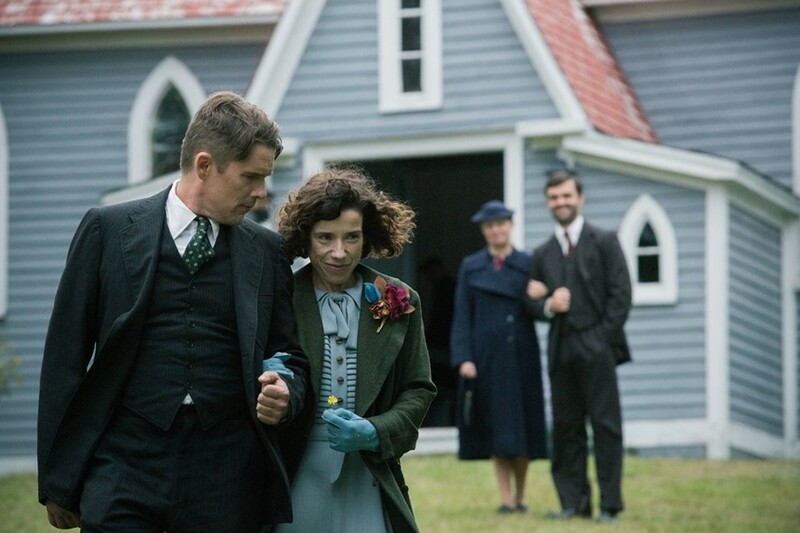 Wonderful performances from Sally Hawkins and Ethan Hawke distract from some storytelling shortcomings in "Maudie," a gentle biopic of Nova Scotian folk artist Maud Lewis. The film opens in the 1930's rural village where Maud (Hawkins) lives with an overbearing aunt, after her family decided the arthritic Maud would be unable to take care of herself on her own. Seeking independence, Maud responds to an advertisement placed by Everett (Hawke), a oafish fishmonger searching for a live-in maid to take care of the household chores he doesn't have time for. In short order, Maud has moved into Everett's tiny, boxlike home, and though he is often verbally and occasionally physically abusive, an affection blossoms between the two. In between performing her daily duties, she carries on with her true passion: painting. The pictures she creates are charmingly simplistic -- brightly-colored nature scenes featuring birds, flowers, and cats -- and over the years they earn Maud a following, making her a beloved figure in the community and eventually the nation. Sherry White's script leaves us to form our own opinions of Maud and Everett's relationship. But there's a warmth and authenticity to Aisling Walsh's directing which helps overcome the sense that at its heart, this is a familiar story of a gruff, closed-off man whose inner tenderness blossoms thanks to the love of a good woman. Hawkins is outstanding, though Maud remains an opaque but fascinating figure. Finding beauty and happiness in a life of hardship, the artist explains how she perseveres: "I don't want for much, as long as I got a paint brush and a window."